Hal, your "first record" sounds like some relic made on a wire recorder at the Cafe Voltaire in 1916! perhaps the digital archiving of your earliest works, the things you did in Indiana with Debbie Jaffe, has now put a renewed emphasis on your Dadaistic beginnings. of course, that quality has always been there in your work, i hear it readily in the collaborative release we did together several years ago, but this new work combines the futurist noise character of Russolo with the spoken word forms of Tzara in an ingenious new fusion. in that way i think it is fitting that you entitled it "first record" as it most definitely seems to belong to an earlier time in your own oeuvre and, via the unique sound qualities of the lathe cutting, an earlier time in cultural history as well. brilliant work! Please consider this as a sound art object. Lathe cut records are not the same as pressed records. They are made one at a time in real time, using an experimental process, with a machine from the 1940s. The grooves are cut into polycarbonate plastic instead of polyvinyl chloride (PVC) like a regular pressed record. The discs are made of a harder material and the sound output is lower than pressed vinyl records. You will need to turn up the volume on your sound system several notches higher than usual. On the positive side, these records will not deteriorate as quickly as regular records. Lathe cut records will play fine on most decent turntables. These records play fine on my $100 Audio-Technica AT-LP60 turntable. Remember: this is a lo-fi audio art object. Think of it as an adventure. Depending on the tracking force and anti-skate setting of your turntable, and other factors, there is a slight possibility that glitches may occur when you play your record. If the record gets stuck, or does not sound quite right (lots of drop-outs) please lift the stylus and move it over a little bit, into a new groove, and consider your playing of the record to be a performance of the record. * Read about my first adventure playing one of these records, below. The price is also higher than most regular records of a similar size and length. These are specialty records unlike anything I have ever done before. They are essentially made by hand, and there is a limited amount. I am charging roughly twice the cost of the disc and the artwork materials. I am doing this in order to pay myself back and to fund a possible future record (a new one and/or a second edition of this one, according to demand). If I receive ample support for this release I might do another one. Or this might be the only record I will ever issue. I understand that many people will not be able to afford this record, and that many people do not own a record player. For those people I suggest checking out the 300 albums I have available online. No trades, promos, freebies, wholesale. I want to be able to do more records and your purchase of this record will make the next one possible. I appreciate your understanding, interest, support, and friendship. not play this record on broadcast radio shows. The only way that this record should be heard is by you playing it on your record player for yourself and for friends in person. I do not mind if you publish texts, reviews, and other verbal commentary on the record, and photos are okay. NO AUDIO online, via file sharing, etc. 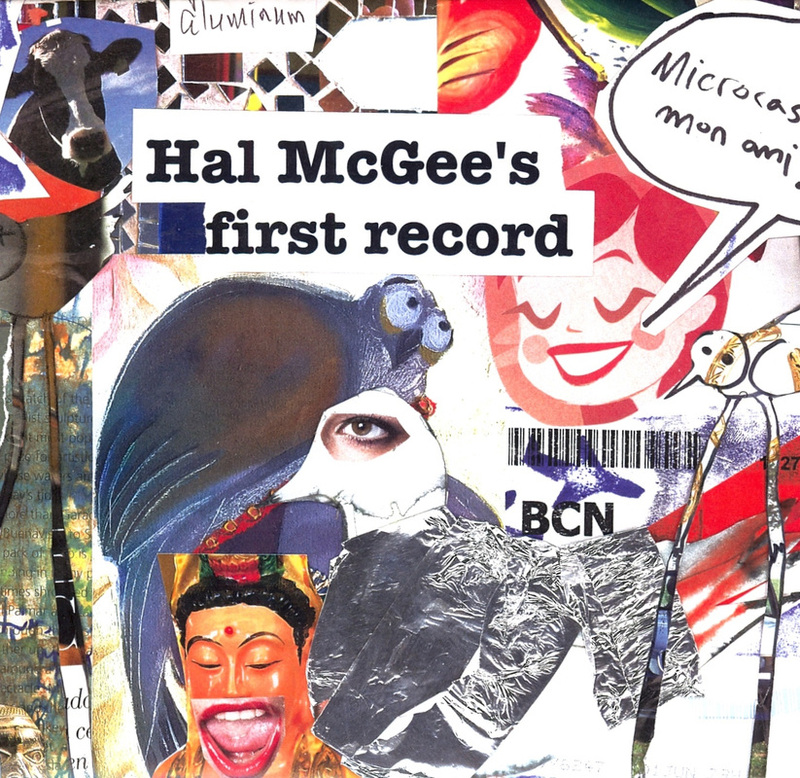 Yes, the title is Hal McGee's First Record. I have previously had recordings on vinyl record releases: Dry Lungs, Pas De Deux, Die Orgasmus Bigband, Undying, and Big Mag 5 - ETNO. This is my first self-produced and -released record. Here is the foldout collage poster that accompanied my personal copy of HAL MCGEE'S FIRST RECORD.